Arthur Philip was born in London in 1738. He attended the Greenwich Hospital School and in 1753 joined a whaling boat. Two years later he quit the whaler and signed on for the Royal Navy. He saw action at the Battle of Menorca (1756) and at the Battle of Havana (1762) by which time he had been commissioned as a lieutenant. The following year the war ended and Philip, without a ship, bought a farm in Hampshire. However, in 1769 he returned to the Navy and by 1774 found himself as the captain of a frigate in the Portuguese Navy during their war against Spain. By 1778, Britain was a war again and he was recalled to the Royal Navy and saw service southern Atlantic and around India. In 1786 he was appointed the governor of the new colony of New South Wales. On arrival, he chose a cove to anchor his fleet and going ashore named it after his friend, and Home Office undersecretary, Lord Sydney. It is recorded that he tried to run the colony as fairly and justly as circumstances allowed, but often government policy and logistic failings negated his decisions. He tried to keep peace with the local Aboriginal peoples and is recorded one occasion following a misunderstanding during a meeting Philip was speared in the shoulder. However, he kept calm and would not allow any retaliation by the colonial forces. 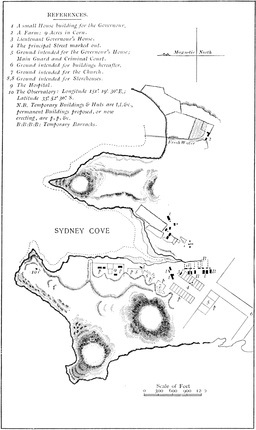 By 1790 the situation had stabilised and the colony was functioning. Convicts were being given land to farm when they completed their sentence in order to supplement the food available for the colony. By 1792, however, Philip unwell returned to England. 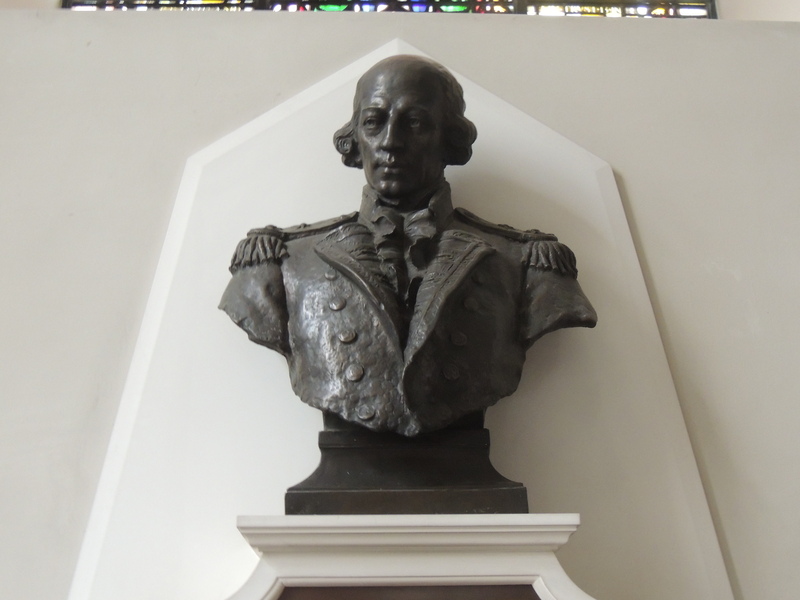 He recovered and returned to Royal Naval service in 1796, being made Rear Admiral three years later before finally retiring from active service as an Admiral in 1805. He died Bath in 1814. There are a number of memorials dedicated to Arthur Philip both in the UK and in Australia. 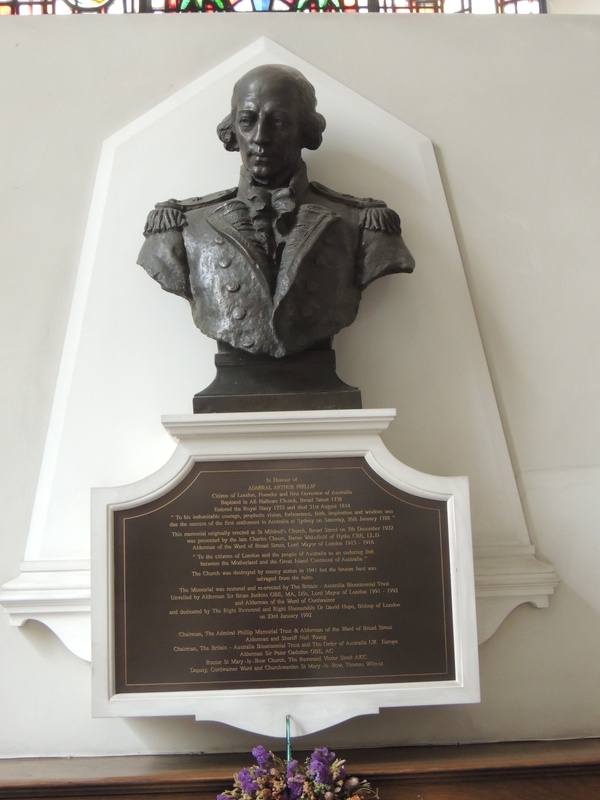 At the dedication of the memorial in Westminster Abbey in 2014, the Dean of Westminster described Phillip as: “This modest, yet world-class seaman, linguist, and patriot, whose selfless service laid the secure foundations on which was developed the Commonwealth of Australia, will always be remembered and honoured alongside other pioneers and inventors here in the nave. The memorial pictured here was originally in St Mildred’s church Bread Street in London but was recovered following the church’s destruction by bombing in 1941 and relocated in St Mary Le Bow.